Premium quality and softness come together in Flat Box Facial Tissue from Kimberly-Clark, providing the comforts of home away from home in convenient sizes. 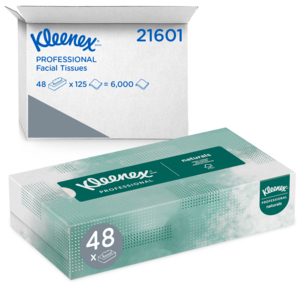 Our KLEENEX® Facial Tissue comes in a full size flat box for placement on a variety of surfaces for the hygiene and convenience of your customers. Our KLEENEX® Facial Tissue Junior comes in a junior size flat box for placement on a variety surfaces for the hygiene and convenience of your customers. Our KLEENEX® Naturals Facial Tissue is made with with Soft Blend* fiber, the perfect combination of soft, virgin fiber and 20% post-consumer recycled fiber.